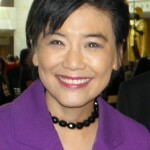 CHARLOTTE, N.C. — Rep. Judy Chu (D-El Monte), chair of the Congressional Asian Pacific American Caucus, addressed the Democratic National Convention on Wednesday. Following is her speech, as prepared for delivery. Many years ago, my grandfather came to this country with nothing — nothing more than a willingness to work hard. Two generations later, his granddaughter became the first Chinese American woman to be elected to Congress in history. And tonight, I address the convention that will re-elect Barack Obama the president of the United States. That’s the American dream. No one ever said that achieving the American dream was easy. And it wasn’t. From the moment my grandfather arrived here, he faced the discriminatory laws of the time — laws that stopped Chinese Americans from becoming naturalized citizens, from voting, from owning land, and even from being hired in any corporation. But he decided to make something of himself anyway. He opened up a small Chinese restaurant. He worked night and day, and day and night. He used that very expensive labor, his sons. And though there were moments when it seemed hard to make ends meet, he still supported his family. It was my grandfather’s dream for his family — his children and grandchildren — that kept him working for 15 hours a day, seven days a week, for decades. It was the American dream that kept him going to lift up our family. Today, President Obama wants to ensure that same opportunity to achieve the American dream is available for all families. The American dream is why President Obama made the largest investment in college affordability in our nation’s history. The American dream is why President Obama has enacted 18 small-business tax cuts and numerous measures to help these businesses access the credit they need to invest, hire, and grow. The American dream is why President Obama did what no president before has been able to do: ensure health care for all Americans. Despite all the good that President Obama has done, Republicans have attacked him at every step. They even turned health care reform into what they thought was a bad word: Obamacare. At first, I resented that term. But then I realized that this was the perfect phrase. Obamacare is perfect because President Obama cares. Obama cares about the education of our children and the security of our seniors. Obama cares about our diverse communities. Obama cares about the middle class that makes America great. Obama cares about small business and big values — justice, equality, and opportunity. And Romney? Well, when the American auto industry and its workers faced hard times, Mitt Romney said, “Let Detroit go bankrupt.” President Obama saved that industry and the more than one million jobs it supports. When young people who came to our country as children turned to the Dream Act as a way to participate in our nation’s future, Mitt Romney said that he would veto it. President Obama gave these patriotic young people a real chance to be a part of America’s success. When seniors facing serious illnesses like cancer need Medicare, Mitt Romney said he would turn it into a voucher system — breaking the guarantee of coverage and costing seniors more than $6,000 out of pocket. President Obama invested in Medicare and added years to its life. Let me ask you: who do you think cares about you? Cares about the middle class? The answer is clear: Barack Obama. President Obama cares about all Americans, regardless of where we came from, when our families got here, what we look like, what our last names are, and whether we’re middle class or working hard to get there. The strength of the American dream is that we all have the opportunity to climb up the ladder, just like my grandfather did. The strength of President Obama is that he will make sure that ladder is sturdy, the steps are close together, and that we all have a shot at the American dream. To strengthen the American dream, let’s re-elect President Obama!